Linda Odom's classes were featured in Country Living Magazine's March 2012 issue. She has taught soapmaking to people from all across the United States. The word you hear most often to describe her? Sweetheart! I couldn't agree more, and she has the prettiest, sparkling, blue eyes! 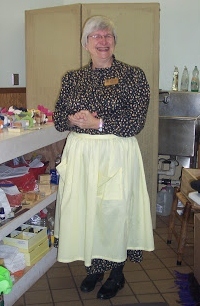 You can find her teaching at the Ozark Folk Center Apothecary. This particular class was limited to only two participants. I was thrilled to be one of them! Meet my classmate, Heidi! She's from the south east corner of Arkansas! It's funny that we both drove three and a half hours from opposite corners of the state! Heidi is delightful! All three of us have lots in common! It is really quite remarkable how many projects we accomplished in only two days. Everything we made went home with us! Linda's experience as a 9th Grade General Science Teacher had her well prepared! Each student received a folder with complete instructions for everything we created. She also included tips on how to use lye soap for things like home made laundry detergent! All lessons were completely hands on. With Linda's instruction, we made three batches of lye soap. Three batches! As we measured, stirred and combined, options for alternate ingredients were discussed. The fragrance for our first batch was holiday inspired and held orange essential oil with cinnamon. Our feminine soap fragrance blended lavendar with rosemary and peppermint. For a masculine touch, our third soap creation was lemon, eucalyptus and tea tree oil. Working with Linda's collection of essential oils was such a treat! Look at all those options! We were allowed free rein to mix them! Linda taught us to use cotton swabs to test a blend before actually using it in a project. While our handmade lye soap was setting, Linda taught us how to make adorable soap bunnies! Lotion bars were on the agenda, too! Soap on a rope is a messy good time! Lastly we made bath salts and spritzers! The Ozark Folk Center Apothecary smells lovely any day of the week, but with all our hard work using the essential oils, it smelled so fabulous! I wish we had a "Scratch and Sniff" option in blogging! I would love to share that with you! If you have any questions about how to make hand made lye soap, Aunt Linda's Soap Making Class is the answer! It is an absolute joy to spend two days with her! When you visit Ozark Folk Center , please give Linda a hug for me! She's the sweetheart with the sparkling blue eyes! That looks like such great fun,and you can tell she is a sweetie just by looking at her! Soap making is such a practical and rewarding project, I know you are going to have a wonderful time experimenting and coming up with your own combinations of oils. And it does make the house smell sweet. Oh wow! What an awesome opportunity and experience that was I'm sure!! :) I haven't ever made homemade bars of soap before, but I've made laundry soap and body wash and LOVED them lol. I wanted to let you know I gave your blog a shout out today on the post Wednesday Weekly Review #18: http://blueeyedbeautyblogg.blogspot.com/2012/12/wednesday-weekly-review-18.html. Oh what a fun post to read! I totally am wishing for the scratch 'n sniff feature! (You know I can't resist smelling snuff!) Linda looks adorable and how nice to have just one other person in your class! What a fun time! What a fun day that looks like. Your Aunt Linda is too cute! I love homemade soap SO much. It's my fav. i have always wanted to make soap! and i think i need a cute aunt linda to teach me how! She is so adorable! I went through a soap making phase when I was younger and insisted that my mom buy me all the supplies and books. Once I had everything I needed, it no longer appealed to me. To this day, I have never made soap. What fun! If I try hard enough, I can almost smell it. The Ozark Folk Center is such a great place with wonderful people. This has been on my list of to-do's for a while! Looks so fun. I hope you will post pictures of your soap once it is cured and cut into bars!! What a fun day! Thank you for linking up with the Clever Chicks this week; I hope you’ll join us again! What an honor to be only one of two to participate in the class. I love homemade soap and I am lucky enough to have a neighbor who makes wonderful soap. I do hope you will share the final products with us. Sounds like an awesome two days, would love to learn to make lye soap from scratch. Oh my gosh that looks like an awesome trip! My first thought when seeing her picture was that she looks like an absolute sweetheart! I would love to take a class like that, you're one lucky lady! Thanks for linking up at the MaMade Blog Hop! :) Have a great weekend! Neat! I have always wanted to make soap. I want to go to class now too! Thanks for linking up with Snickerdoodle Sunday.